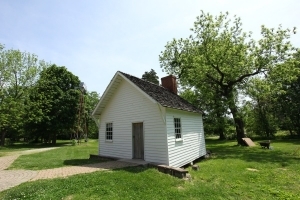 Today, Riverside, the Farnsley-Moremen Landing features the restored historic house, a reconstructed 19th century kitchen building, on-going archaeological excavations (seasonal), and a kitchen garden where volunteers grow many of the same vegetables and herbs that would have been part of the meals served during the 19th century. In addition, the site offers a breathtaking view of the Ohio River framed by rolling hills on the opposite bank. Riverside’s centerpiece is the historic Farnsley-Moremen House, which was purchased by Jefferson County in 1988 and underwent extensive restoration before it opened to the public in October of 1993. In 1997, Jefferson County added the Aydelott-Rosenberger House (built circa 1868) to its holdings. The entire 300-acre tract–including both historic houses–was designated as a Jefferson County Historic Landmark District in 1998. Riverside completed its most recent Site Development Plan in January of 2006. The plan takes a comprehensive look at the 300-acre site. The Site Development Plan established a location for the “Moremen Family Chapel” moved to the property from its original location at Dixie Highway and Bethany Lane on March 19, 2006 to the area near the 1868 Aydelott-Rosenberger House. The plan also developed detailed plans for parking, pathways and vehicular connections to link the future rental complex at the Aydelott-Rosenberger section of the property with the Farnsley-Moremen complex. Contact us at info@riverside-landing.org to find out how you can become involved in the effort to realize the vision for the property outlined in the Site Development Plan. In 1999, Riverside dedicated its reconstructed detached kitchen behind the historic Farnsley-Moremen House. Extensive archaeological research provided the basis of information for this reconstruction. The research indicates the kitchen stood from the 1830s through the late 1870s. 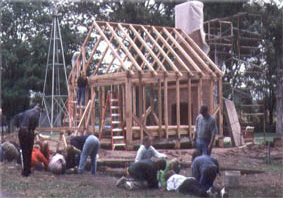 Restoration Group, Inc. of Lexington, Kentucky finished the reconstruction in the spring of 1999. The kitchen was excavated with the help of thousands of school children and other volunteers who worked under the guidance of professional archaeologists. Architectural historian Bill Macintire of the Kentucky Heritage Council conducted additional research. Mr. Macintire also drew the architectural plans for the kitchen. any domestic artifacts were found in the kitchen excavation site, such as children’s toys, sewing implements and fragments of smoking pipes. One artifact is a pewter spoon handle marked with an “X”. Similar artifacts marked with an “X” have been found by archaeologists at slave sites throughout the southeastern United States. The kitchen building has been reconstructed with a loft space and it is interpreted as a possible living space for the cook, an enslaved African American. Riverside has reproduced a collection of Moremen family recipes under the title “Riverside Receipts.” This collection was published in conjunction with the kitchen dedication and it includes a brief history of the property and the kitchen reconstruction project. It is can be purchased or ordered from the Riverside Museum Store. 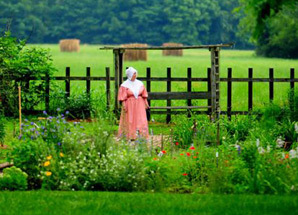 Riverside’s Kitchen Garden is located in the same area where the Moremen family had their kitchen garden for 126 years. Tended by a dedicated group of volunteers, the Riverside Kitchen Garden provides visitors with a look at what the Moremen family may have grown for consumption at their own table. The 60′ x 120′ garden features heirloom vegetables, herbs and some flowers. 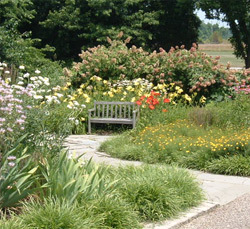 The Jeanne Montgomery Garden serves as the front door to the Riverside Visitors Center. This lovely garden is dedicated to Jeanne Montgomery who served former Jefferson County, Kentucky County Judge/Executive Harvey Sloane as a Family and Neighborhood Services Coordinator. Ms. Montgomery worked to save the historic Farnsley-Moremen House before its purchase by Jefferson County in 1988. She was instrumental in recommending the Citizens Advisory Committee (it later became Farnsley-Moremen Historic Home, Inc.) which would work with Jefferson County to restore the house. Unfortunately, Jeanne Montgomery did not live to see her dream to restore the house come true. The garden dedicated to her memory serves as a testimony to her hard work and vision. Any visit to Riverside, the Farnsley-Moremen Landing should begin at the Visitors Center. The Visitors Center is the gateway to the site, offering orientation exhibits, ticket sales, a museum store and restroom facilities. 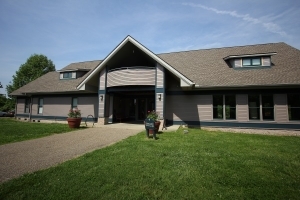 See Rental Information for more on use of the Visitors Center for your private event or call (502) 935-6809.